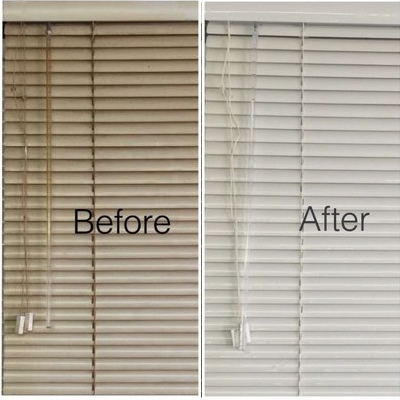 At Blind Cleaning Perth we will make your blinds like new again with our Ultrasonic Blind Cleaning Perth and blind repairs service by Star Cleaning Solutions. Blinds can be very expensive to replace so it is more cost-effective to clean and restore them. We, as blind cleaning Perth experts always strive to provide a hassle-free service transforming those dirty, dusty, soiled, moldy and poorly maintained blinds, restoring them to their former beauty. Amazing clean, blinds that look good and smell fresh! This is a very cost-effective treatment used by us at blind cleaning Perth that removes dust, grime, grease, dust mites, bacteria, mold and most stains from your blinds. Ultrasonic waves are used to vibrate the cleaning solution at extremely high velocity, causing millions of tiny bubbles to penetrate every part of the blind and then implode, removing every trace of unwanted grime. We recommend regular blind cleaning to avoid allergies from dust mites, problems with asthma and other health issues related to built up dirt, dust, mold, bacteria. Our same day blind cleaning Perth service offers removal of your dirty venetian blinds – or vertical blinds, aluminium blinds, pvc blinds, timber blinds, cafe blinds, roller blinds, roman blinds, – at a convenient time of the day. They will be taken to our blind cleaner Perth warehouse for ultrasonic cleaning and small repairs if needed, blinds are then rinsed in purified water to leave no marks, then returned and re installed later in the day. Other arrangement can be made on request, please call us to discuss. Our state-of-the-art modern ultrasonic equipment is Made In Australia by KleenTek Advanced Cleaning Technologies. … and many other types of window blinds. At Star Cleaning Solutions Perth we strive to provide same day blind cleaning whenever possible. We will pick up the blinds for cleaning in the morning and will return to re-install them in the afternoon. For this reason we recommend booking to arrange a suitable day and time. STAR CLEANING SOLUTIONS.. The Blind Cleaning Perth Specialist!